[S11] 1910 United States Federal Census, online , Year: 1910; Census Place: Mentz, Cayuga, New York; Roll: T624_928; Page: 2B; Enumeration District: 0047; Image: 768; FHL microfilm: 1374941. [S11] 1910 United States Federal Census, online , Year: 1910; Census Place: Montezuma, Cayuga, New York; Roll: T624_928; Page: 3B; Enumeration District: 0049; Image: ; FHL microfilm: 1374941. [S26] 1900 United States Federal Census, online , Year: 1900; Census Place: Brutus, Cayuga, New York; Roll: T623_31077_4114483; Page: 2B; Enumeration District: 0023; FHL microfilm: 1241012. [S65] 1920 United States Federal Census, online , Year: 1920; Census Place: Brutus, Cayuga, New York; Roll: T625_1089; Page: 5B; Enumeration District: 24; Image: 826. [S11] 1910 United States Federal Census, online , Year: 1910; Census Place: Brutus, Cayuga, New York; Roll: T624_927; Page: 9A; Enumeration District: 0034; Image: ; FHL microfilm: 1374940. 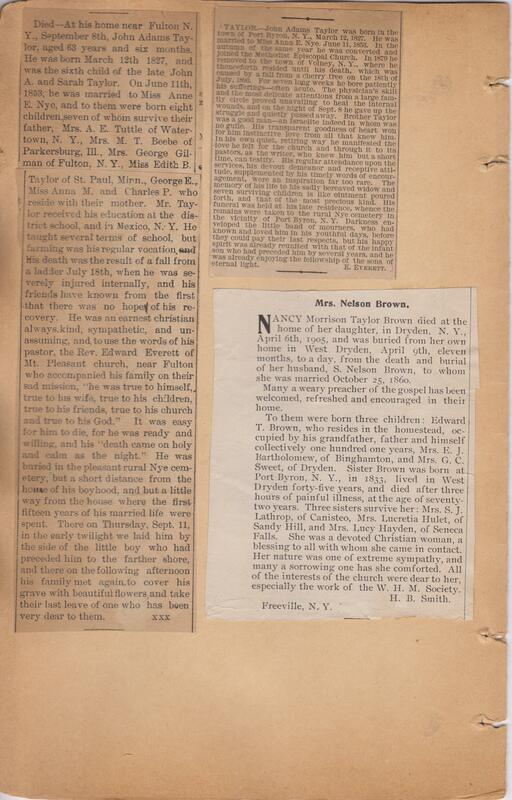 [S1092] Unknown family info, Nye Family Bible Transcriptions (n.p. : n.pub., unknown publish date); Jessie-Jean Pustis, e-mail address. [S1] 1870 United States Federal Census, online , Year: 1870; Census Place: Sterling, Cayuga, New York; Roll: M593_; Page: ; Image: . [S2] 1880 United States Federal Census, online , Year: 1880; Census Place: Volney, Oswego, New York; Roll: 915; Family History Film: 1254915; Page: 261A; Enumeration District: 274; Image: 0524. [S1093] John Adams Talyor and Anna Nye Family, Taylor Bible (Hartford, CT: Case, Lockwood and Co., 1865); Jessie-Jean Pustis, e-mail address. [S2] 1880 United States Federal Census, online , Year: 1880; Census Place: Jefferson, Elkhart, Indiana; Roll: 275; Family History Film: 1254275; Page: 245B; Enumeration District: 029; Image: 0311. [S26] 1900 United States Federal Census, online , Year: 1900; Census Place: Jefferson, Elkhart, Indiana; Roll: T623_369; Page: 8A; Enumeration District: 26. [S11] 1910 United States Federal Census, online , Year: 1910; Census Place: Jefferson, Elkhart, Indiana; Roll: ; Page: ; Enumeration District: ; Image: . [S1] 1870 United States Federal Census, online , Year: 1870; Census Place: Jefferson, Elkhart, Indiana; Roll: M593_; Page: ; Image: . Francois Jette was born circa 1810 at Canada.1 He married Adelaide Besset in 1837 at Marieville, Quebec, Canada.2 Francois Jette lived in 1860 at Conquest, Cayuga, New York, USA; Age in 1860: 50.1 He died in 1878. [S11] 1910 United States Federal Census, online , Year: 1910; Census Place: Three Rivers Ward 4, Saint Joseph, Michigan; Roll: ; Page: ; Enumeration District: ; Image: . [S75] Ancestry.com, World War I Draft Registration Cards, 1917-1918 (n.p. : Online publication - Provo, UT, USA: Ancestry.com Operations Inc, 2005.Original data - United States, Selective Service System. World War I Selective Service System Draft Registration Cards, 1917-1918. Washington, D.C.: National Archives and Records Admini, unknown publish date), Registration Location: Fresno County, California; Roll: 1530791; Draft Board: 0. [S26] 1900 United States Federal Census, online , Year: 1900; Census Place: Park, Sedgwick, Kansas; Roll: T623_499; Page: 1B; Enumeration District: 270. [S26] 1900 United States Federal Census, online , Year: 1900; Census Place: Mentz, Cayuga, New York; Roll: T623_1013; Page: 17A; Enumeration District: 33. [S65] 1920 United States Federal Census, online , Year: 1920; Census Place: Mentz, Cayuga, New York; Roll: T625_1089; Page: 7A; Enumeration District: 36; Image: . [S61] 1930 United States Federal Census, online , Year: 1930; Census Place: Auburn, Cayuga, New York; Roll: 1411; Page: 9A; Enumeration District: 23; Image: 572.0; FHL microfilm: 2341146. [S69] 1940 United States Federal Census, online , Year: 1940; Census Place: Port Byron, Cayuga, New York; Roll: T627_2508; Page: 4A; Enumeration District: 6-55. [S9] Ancestry.com, 1860 United States Federal Census (n.p. : Online publication - Provo, UT, USA: Ancestry.com Operations, Inc., 2009. Images reproduced by FamilySearch.Original data - 1860 U.S. census, population schedule. NARA microfilm publication M653, 1,438 rolls. Washington, D.C.: National Archives and Records, unknown publish date), Year: 1860; Census Place: Conquest, Cayuga, New York; Roll: ; Page: 813; Image: 336. [S61] 1930 United States Federal Census, online , Year: 1930; Census Place: Auburn, Cayuga, New York; Roll: 1411; Page: 7B; Enumeration District: 18; Image: 421.0; FHL microfilm: 2341146. [S69] 1940 United States Federal Census, online , Year: 1940; Census Place: Auburn, Cayuga, New York; Roll: T627_2507; Page: 7B; Enumeration District: 6-30. Notes: Jan 1937: Name listed as PAUL RICHARD JETTY. [S75] Ancestry.com, World War I Draft Registration Cards, 1917-1918 (n.p. : Online publication - Provo, UT, USA: Ancestry.com Operations Inc, 2005.Original data - United States, Selective Service System. World War I Selective Service System Draft Registration Cards, 1917-1918. Washington, D.C.: National Archives and Records Admini, unknown publish date), Registration Location: Onondaga County, New York; Roll: 1819045; Draft Board: 4. 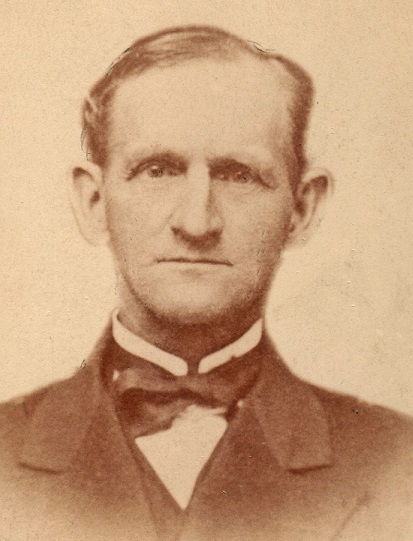 Jack O Bleak was born circa 1830 at Germany.1 He married Jane O Bleak. [S9] Ancestry.com, 1860 United States Federal Census (n.p. : Online publication - Provo, UT, USA: Ancestry.com Operations, Inc., 2009. Images reproduced by FamilySearch.Original data - 1860 U.S. census, population schedule. NARA microfilm publication M653, 1,438 rolls. Washington, D.C.: National Archives and Records, unknown publish date), Year: 1860; Census Place: Montezuma, Cayuga, New York; Roll: ; Page: 725; Image: 248. Jane O Bleak was born circa 1832 at Germany.1 She married Jack O Bleak. [S44] Town of Montezuma Records, online http://web.archive.org/web/20020215005729/http://…, (Waybackmachine), O'Brien, Ann May 27, 1893 72 Ireland James Ford Ann.